Sheila Stortz - Heritage Funeral Homes Inc.
of Arthur passed away peacefully at the Caressant Care Nursing Home, Arthur on Tuesday, September 25, 2018 in her 89th year. 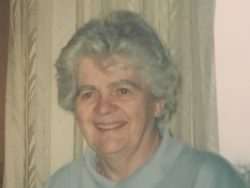 Beloved wife of the late Ambrose Stortz (1987). Dear mother of David and Alison Stortz of Kanata, Maureen McDonald of Arthur, James and Tena Stortz of Mount Forest, Mary Ann and John Stevenson of Kenilworth and Ian and Dee Stortz of Arthur. Sadly missed by her grandchildren Matthew Stortz; Steven McDonald and Jen McDonald and friend Matt; Breann Stortz and Ashley Stortz; Stacey Stevenson and her fiancé Brandon, Jessica Stevenson and friend Thomas; Brandon, Cole, Olivia and Shaelyn Stortz. Sister of Fred O’Donnell, sister-in-law of Fr. George Stortz, Adele Raftis, Peggy O’Donnell and Larry and Barb Stortz. Fondly remembered by goddaughter Brenda Murray as well as her nieces, nephews and friends. Predeceased by her parents Francis and Irene (Coffey) O’Donnell, brothers Wilfred, Michael, Brendan and James O’Donnell, sister Therese Saunders brothers-in-law Frank Stortz, John Stortz and sisters-in-law Helen Walsh and Genivieve Robertson. The family will receive friends at the Crawford Funeral Chapel, 243 George Street Arthur on Thursday, September 27, 2018 from 2 to 4 and 7 to 9 p.m. A Funeral Mass will be Celebrate in the St. John’s Roman Catholic Church, Arthur on Friday, September 28, 2018 at 11:00 a.m.
As expressions of sympathy donations to the St. John’s Roman Catholic Church, Arthur would be appreciated by the family. Parish prayers will be recited in the funeral home on Thursday evening at 6:30 p.m.